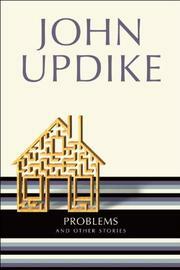 Divorce is the tonic note of this volume of new Updike stories, his first in seven years. True to form, each story here hugs a particular stage in a man's life--and whether Updike makes him an engineer, potter, or an archaeologist, he's the same sensitive man. Children now are almost fully grown; one wife has been left, another taken. Guilt, skin disease, and other "problems" visit these narrators. Some of the pieces are weed-slight: travelogues of Reno and Ethiopia and a highway vacation with children. The attempts at humor--"Minutes of the Last Meeting"--are predictably lame; also a bit tired are the religious/sexual communions. Strongest, probably because most deeply, passionately felt, are the stories of a divorce in the making: "Separating," about Updike's famille de plume, the Maples, is one of his best. But the surprise of the collection is a story called "Transaction": a married man in a strange city contracting for the services of a street prostitute. Edge and light are contributed here by the straining, word-staining extra inch that Updike goes in order to capture an experience and sensation that's newly shaming; his stories lately have so strongly become personal essays, stacked-up catalogues of reactions, that this departure into nervous newness absorbs, as a risk taken, a stepping out into shaky ground. Otherwise, it's an uneven volume, falling in sum a bit short of prime Updike--but the best stories here are among the best anywhere.